Weirdly #wellnesschallenge: Automatically generate your own daily wellness activity for super-fun team times. Join the Weirdly #wellnesschallenge. Our automatic wellness challenge generator makes it easy. Get ideas for you and your team, every day. At Weirdly, embedding wellness into our everyday company culture is really important. Every morning in the Weirdly office starts with a team standup. Standing around the whiteboard, each member in our band of misfits write up three priorities for their day: Two outcomes or tasks we need to tick off our to-do lists, and one wellness challenge. Everyone chooses a different wellness challenge each day – it could be getting creative with coloured pens one day, doing 5 press-ups the next, or eating lunch with a new person (away from your desk!). Then, the next morning we report back to each other on our success before erasing yesterday’s challenges and starting fresh. Building wellness into an every-day ritual helps build a culture of mutual respect, encouragement, awareness and (most importantly) fun. Having it shared with the team means we’re accountable to each other – just like we are with the tasks that are more traditionally “job-related”. To be totally honest, it felt a little contrived at first. Like we were trying to force fun. But very quickly (like, within the first day) we realised it was working. We were more mindful and aware of each other and making these activities an Important Ritual actually made them feel more valuable and allowed us to make space for them in our day. We’re a tighter team: Inevitably, every morning now starts with everyone together, spending 2mins laughing, joking and encouraging. It’s a quick connection (we’re all busy), but it happens without fail. Compared to two months ago, when people could wander in, throw headphones on and start the day with the barest of hellos, it’s like night and day. We’re more of a team now. Every week there’s a new in-joke, we’re habitually looking for ways to encourage each other. It all leads to getting to know each other better and building a stronger, more mutual respect. Feedback has increased (and improved): One of our most popular challenges has to do with compliments. At Weirdly, we call them #chuffys (things that make you feel chuffed – I know, just roll with it). Every week at least one of our challenge options is about noticing something awesome someone has done and giving them mad props. Creating a culture where we’re constantly on the hunt for opportunities to give positive feedback, means it’s easier when the time comes to give harder feedback. We’re more comfortable talking to each other honestly, and we’re more receptive. Happiness is on the rise: It’s been a pretty pressured time at Weirdly HQ over the past few months. Crucial team-members away visiting companies in the USA, our first integrations being built and launched and hard decisions being made about raising (or not raising) more investment. Stress levels were primed to rise but all-in-all, it’s gone by fairly smoothly. Our morning wellness ritual helped us connect and re-align every day. Having challenges to complete everyday meant we were all forced to look up from our screens and refresh our perspective regularly. These two things have made for a happier team full of happier people (even on the days we’re all running on caffeine and adrenaline). 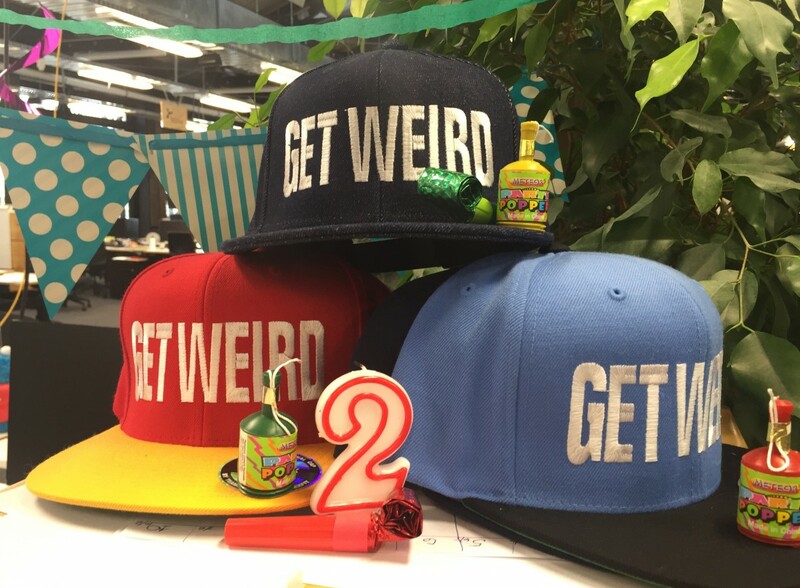 Embedding wellness into our culture has been brilliant for us Weirdos, and as part of our 2nd birthday celebration we wanted to help other businesses do the same in their own teams. So we’re issuing a #wellnesschallenge. Spend a month with your team (or on your own) completing one wellness challenge every day and watch your culture grow. We’ve even built an automatic wellness challenge generator for you to make it really easy. This takes the pain out of coming up with a new thing to do everyday. Just jump onto this site each morning (with your team or by yourself), and press the button. Our auto-generator will magically pull up a challenge for you to complete that day. Share your #wellnesschallenge on Twitter, Facebook or LinkedIn – we might even send out some sweet Weirdly swag for awesome photos of teams getting into the Weirdly #wellnesschallenge spirit!